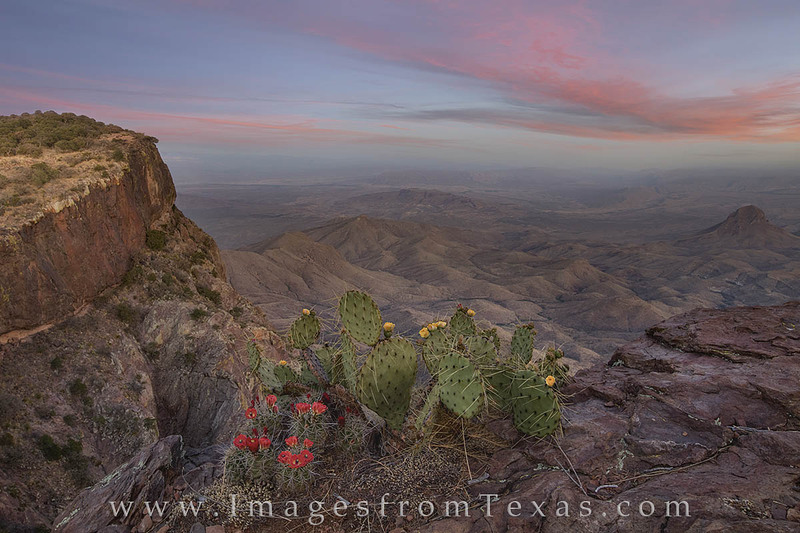 From the South Rim at Big Bend National Park, a claret cup cactus and a prickly pear cactus show off colorful flowers as the last light of day turns the sky pink and blue. The trek to reach this point is often over 13 miles round trip (13.68 for me according to the GPS). To shoot here at sunrise or sunset, you either have to walk back in the dark or camp. But the landscapes are stunning and unlike anything else you'll see in Texas. This is one of the classic hikes of the Lone Star State. Photo © copyright by Rob Greebon.